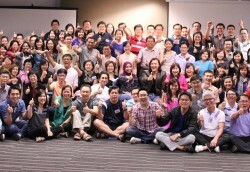 Congratulations to all Property Riches Program batch 14! What a dynamic group! We had loads of fun and I would like to thank all our participants for your positive feedback. This is what keep us going. We recently held the Property Riches Program at our WK Events office at AXA Tower. It is a two and half days program which is power-packed with valuable cultivating savvy investor mindset for people who want to create sustainable wealth through property investments. During the program, we have discussed about the latest property cooling measures and how it will affect the property market here in Singapore. We also shared where are the undervalued investments in Singapore across the residential, commercial and industrial sectors. More importantly, we also identified some undervalued sectors in other parts of the world as well. We would like to thank our guest speakers who also discussed passionately their predictions on the Singapore property market for the rest of the year and where, in their view, will be the opportunities for investors. We also shared many real life examples of fantastic deals that we’ve done before and how to structure deals starting with little money down. Besides all these very valuable information that we have disclosed, we also shared how to spot and seize opportunities, how to calculate yields, returns on investment, how to avoid costly mistakes and our formula for building substantial and sustainable wealth. We have lined up some exciting deals for our network as this has been our successful model of finding undervalued deals, bulk discount deals in order to generate good returns to our investor network. Thank you all for your faith, trust and support. And also, a big thank you to my team members whom have been working extremely hard to ensure that the program run well and is well supported! Great pointers you listed here. Good luck to your program and I do hope that it will grow more in the future.